Days are long and hot, the garden is booming, and the wilds are abundant with berries and fruits. Now is not exactly cold and flu season, but it is the time to pull out our elderberry syrup recipe. Why? Because very soon the wild and cultivated elderberries will be heavy with fruit and ready to harvest. 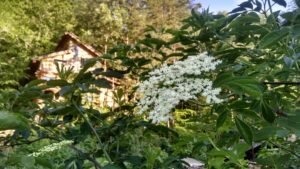 Here’s our basic recipe, some ideas for customizing yours and an elderberry profile so you can get to know this amazing plant a little bit better. There are actually more than 25 species of elderberries that grow all over the world. All are shrubby plants with pinnate leaves arranged oppositely and with flowers and fruits that come in clusters. Here in North America, we have about 10 kinds, of many different colors and characteristics. When we’re making magical medicine to fight colds and flus, however, black elderberries are what we’re after. Harvest time: Flowers: Late April to early June; Fruit: July to August (varies from year to year, depending on weather); Leaves: Spring to fall. Parts used: Flowers and fruit for food and internal medicine; leaves for topical medicine; hollow stalks for flutes and spyles to tap maple trees. Elderberries are considered “nature’s medicine chest” by many herbalists. 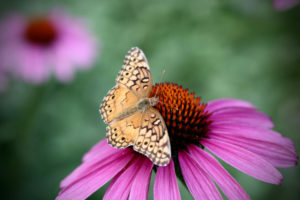 Their flowers are used in the treatment of colds and flus, along with any inflammation of the upper respiratory tract. After the flowers come the fruits, which are the most widely used part. These are helpful in preventing and treating influenza (the flu) and for protection against all kinds of other viral infections. Lesser known as a medicine, elderberry leaves can be used (externally) to treat bruises and sprains. According to David Hoffman, in his book Medical Herbalism, elderberries (both the flowers and fruits) have been shown to decrease the chances of contracting the flu and to shorten its duration if you happen to get it. Additionally, people who take elderberry during a flu will be less likely to use over-the-counter drugs for symptom relief, according to a study in the Journal of Internal Medical Research. Along with being powerful healers, elderberries (and flowers) are delicious. When made into jams, jellies and relishes, elderberries impart a regal purple color and a rich, tart flavor. Similarly, elderberry juice (even just a splash) will transform drinks into tantalizing fuchsia elixirs. 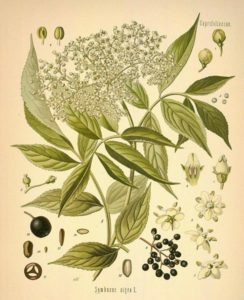 Elder flowers can be eaten, too, but are more commonly used for flavoring in syrups, sodas and liqueurs. If you want to just eat the whole cluster of small flowers on their stems, battered and fried is the way to go. Otherwise, steep the fresh or dried flowers in hot water or alcohol – or ferment them with a wine or mead. St. Germaine is a deliciously floral French liqueur made from elderflowers purportedly harvested from the French countryside and brought to the distillery by bicycle. Very fun and very fancy! With a name like “elder,” you know this plant has a storied relationship with people. In fact, all over Europe, elder trees are associated with some kind of spiritual power. In Celtic traditions, they’re thought to house protective spirits. Because of this, people are known to hang branches above their doorways or in their bedrooms. It’s believed that when you cut down an elder, its spirit – the “elder mother” – is released. Depending on how you approached your harvest, including what songs you sang or forgot to sing, she may be friendly or angry. 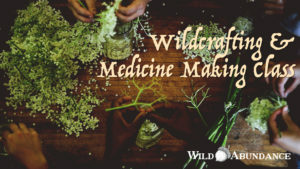 To learn more stories and lore about elder and other plants, check out our Wildcrafting and Medicine-Making Herbalist Course. Along with hearing tales of plant spirit hijinks, you’ll get hands-on guidance and practice in making many kinds of medicinal preparations. Our instructors are as engaging and funny as they are wise. 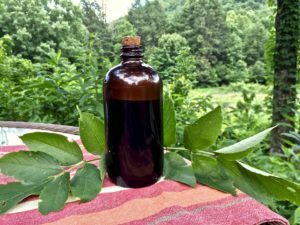 This basic recipe for elderberry syrup comes from our dear friend and mentor, Juliet Blankespoor, at the Chestnut School of Herbal Medicine. Begin by making the elderberry tincture. It will will need at least 2 weeks to macerate (i.e., “hang out,” with the alcohol extracting medicinal compounds from the berries). Fill a quart-sized mason jar halfway with de-stemmed elderberries. Pour in enough 190 proof (95%) alcohol to fill the jar. If you can’t find alcohol that strong, use the strongest you can find; anything above 150 proof will still yield a shelf-stable syrup. Seal and store in a dark place, shaking daily (or daily-ish; if you happen to miss a day, don’t fret). After 2 weeks – or longer (it won’t go bad) – strain out the berries, and voila, there’s your tincture. You can use a cheesecloth-lined potato ricer (or simply a cheesecloth, squeezed with your hands) to extract the last bit of tincture that’s inside the swollen berries. Next, make the elderberry honey. Juice 4-5 cups of de-stemmed elderberries, reserve 2 cups of juice. To do this, you can use a press-style juicer like a Champion or Green Star. Or, you can squish the berries with your hands or a wooden pounder; then strain out the solids using a cheesecloth. Add the 2 cups of elderberry juice to 3 cups of honey. Gently warm this mixture (a double boiler works well), stirring often, until all the juice has evaporated and you are left with 3 cups of honey. If you have more than 3 cups of honey, the mixture contains more water than perfectly-balanced honey (which does not spoil); the added moisture can lead to mold. This isn’t a problem if you’re going to make your elderberry syrup right away. But, if you’re going to store the honey for any length of time, it must not have extra moisture. Finally, make the elderberry decoction. The word “decoction” simply means a strong tea that has been simmered and not just steeped in hot water. Chances are, you’ve made a decoction before, whether or not you used this fancy term. Mix together 3 cups of de-stemmed elderberries and 3 cups of water in a pot. Cover and bring to a boil; then lower the heat to a lively simmer. Let simmer for about 1 hour; then strain out the solids and you are left with your decoction. Let it cool somewhat before proceeding to blend your syrup. This is because a very hot temperature will cause evaporation of some of the alcohol, throwing off your final product. Once you have made the three ingredients, blend them together in a glass jar and shake until the syrup is uniform. Because of the alcohol content, this elderberry syrup recipe produces a shelf-stable product; there is no need to refrigerate it. Recommended (adult) dose is 1 teaspoon, 1 to 5 times per day. If you’d love for this blog post to turn into a friendly, human teacher who will actually show you all these steps and more, check out our Wildcrafting and Medicine Making Herbalist Course. From this basic elderberry syrup recipe, you can branch out and customize your syrup depending on your particular needs and what you’ve got on hand. For example, you could substitute some of the tincture, honey or decoction with the same type of extraction of another herb. Using other ingredients that are also immune-boosting and/or anti-viral will make your medicine even more powerful. If you have a bottle of reishi tincture, or a bunch of lemon balm lying around, these are both great additions. Echinacea, ginger and osha are other fine additions. If you stick to the basic ratio of 1 part tincture, 1 part honey, 1 part decoction, your elderberry syrup will still be shelf-stable. 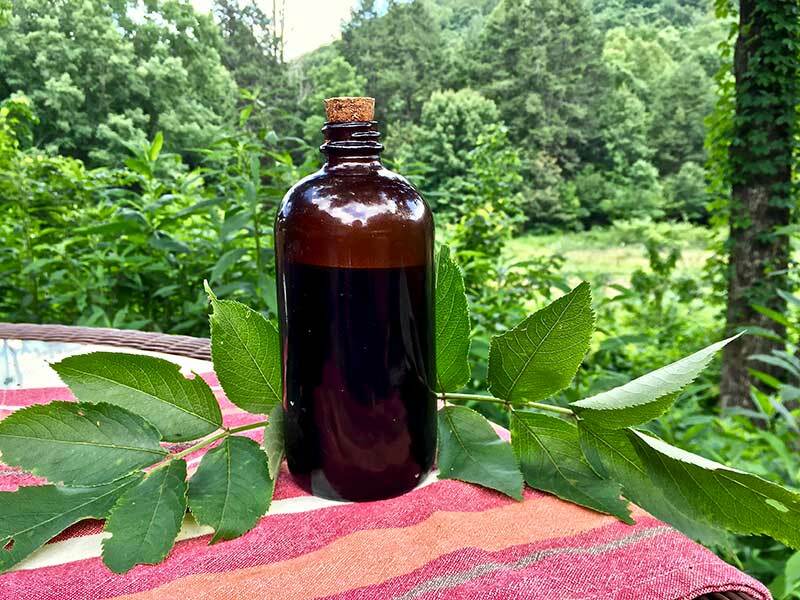 To make elderberry syrup for kids, elders, or anyone wishing to avoid alcohol, simply omit the tincture. Instead, use 2 parts decoction and 1 part honey. You can also add other herbs to this modified syrup; just make sure that they are gentle enough for more sensitive systems (elderberry itself, thankfully, is wonderful for children). The alcohol-free version of this elderberry syrup recipe will not be shelf stable – but will keep in the refrigerator for a month or more. Another option is to freeze the syrup in ice-cube trays. Depending on your ice-cube tray, one thawed cube will contain 1 to 3 days worth of medicine. Wild Abundance is here to empower people with skills for self-sufficiency and interdependence. We develop deeply meaningful and effective classes, programs, and demonstration sites to bring people closer to the each other and to the web of life. We believe that these skills are humanity's legacy; we strive to make them accessible to all people with a hunger to learn through sliding scales and scholarships.